THE Illawarra Hawks have bounced back from a horror home loss to Brisbane with a shock 78-71 triumph over NBL leaders Sydney on Saturday. American forward Brian Conklin hit six straight free throws in the final quarter to finish with 17 points in an unfamiliar role off the bench. The Kings slipped to 11-6 for the season and coach Andrew Gaze would've been disappointed with his team's patchy performance. Jerome Randle had 13 points for Sydney, and Andrew Bogut finished with eight points, 19 rebounds and four blocks. The Kings struggled to build momentum throughout the first half, continually forced into difficult shots by a smothering Hawks defence. Veteran centre Dave Andersen scored seven early points to help Illawarra to a 17-15 quarter-time lead, and Coenraad came out firing off the bench to pace the home team's scoring in the second period. Sydney were badly out of sync, hitting just nine of 32 shots and missing nine of 10 three-point attempts as the Hawks stretched the lead to 38-26 at half-time. Randle led the Kings with eight points, and Bogut had six and hauled in 10 rebounds. They extended the margin to 10 before Lisch nailed a pair of clutch three-point shots to cut it to a single point with four minutes remaining. 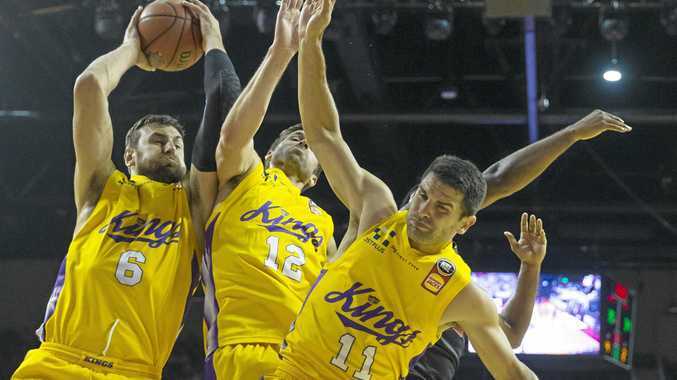 The Kings head to Cairns for a Monday night clash with the Taipans, and the Hawks host Adelaide to tip off round 13 on Thursday.